This is the first publication to document the work of Bettina Furnée. It tracks a particular project that has been the focus of Furnée‘s practice since 2004: If Ever You’re in the Area. Now coming to a close, this body of work has been developed inside and outside of the gallery, featuring off-site works along the East coast and exhibitions at firstsite and The Naze Tower in Essex. A complex project, If Ever You’re in the Area explores ideas of war, migration, fear and reminiscence associated with invasion of the coast. 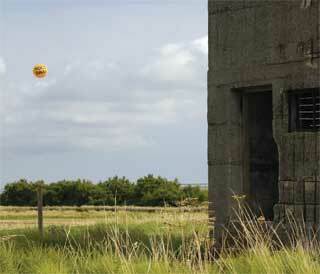 Furnée‘s site specific pieces have included lettered flags on the eroding coastline at Bawdesy, Suffolk, and signed Semaphore messages to the Principality of Sealand. The participatory aspects of Furnée‘s work is explored in an essay by Elizabeth Fisher; texts by poets Simon Frazer and Tony Mitton – who worked in collaboration with the artist – are also reproduced throughout the book. Edited by Annabel Lucas, with an introduction by Laura Earley and an essay by Elizabeth Fisher. Texts appear throughout by poets Simon Frazer and Tony Mitton. The publication has been developed by Bettina Furnée with firstsite during the project If Ever You’re in the Area and the exhibition at firstsite 18 June – 23 July 2005. This publication was released on 1st July 2006 to coincide with the exhibition and event day ‘Lines of Approach’ by Bettina Furnee at the Naze Tower. BBC Radio Essex covered this event with a live broadcast 2-5pm with ‘Steve Scruton’s Summer Saturday’. The book is available from firstsite @ the minories. also available from firstsite: www.firstsite.uk.net.